I've only been following Danice's blog, Our Inspired Journey, for a few weeks, but I have been so blessed by her beautiful heart and Christ-centered perspective. I was so excited when she agreed to write a guest post for the Heart of the Homemaker series. 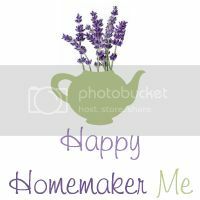 Please visit her blog and share some happy homemaker love! I hope you are blessed by this loving wife, wonderful mother, and daughter of our King. It’s an honor to be asked to contribute to such a wonderful series. Being a stay-at-home mom to my four children is one of the greatest blessings I could’ve ever anticipated having in my lifetime. I know some moms who would LOVE to be in our shoes…the shoes that trod more on the carpet in our own living room than in a workplace, but they can’t. They may be single or married, but whatever their circumstance, the cards have fallen and they need to work and support their family by bringing in a much needed paycheck. I respect their sacrifice, deeply. They truly are some of the unsung heroes of our day. 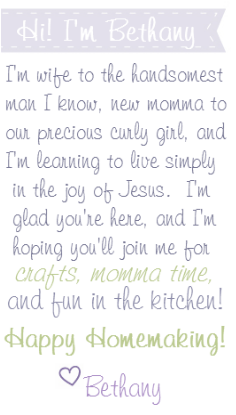 It’s so easy to get lost in our own little world when we are homemakers by profession. How strange it is to feel “lost” at home, but the truth is…it happens. You know what I mean if it’s happened to you. I remember sitting in her room just weeks after my fourth little one was born. My husband was a grad school student at the time and out late most nights assisting the university’s marching band. 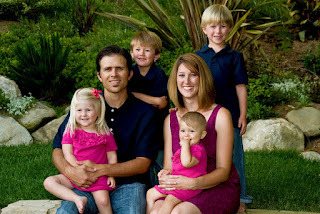 Those first several months with four kids, ages 5 and under, I remember some dark moments I couldn’t see my way out of. I can remember holding her as she struggled to nurse while I could hear my other three fighting in the other room. I felt powerless to handle the task before me. How could I do this without going crazy? You see, before I had children, I was a self-proclaimed perfectionist. To the T. I worked hard to have everything work out exactly the way I thought it should…every time. I would gladly stay up until 4am if it meant the project I was working on would turn out “right.” Before I became a mom I was an elementary school teacher and I can’t tell you how many late-nights and weekends that I spent (often times with my reluctant husband) in my classroom to make it all “right.” I was a slave to my own ideals and honestly…prideful. I didn’t realize it at the time, but I cared way more deeply than I should have, about what others thought about me. I wanted them to know I cared, and that was expressed through my exhaustive efforts to perfect every task at hand. I wanted people to think…”She’s got it all together.” I really wanted to have it all together, until God reminded me, no one does. If we did, He wouldn’t have had to do what He did in leaving the comforts of Heaven to come to us. Isn’t He good? My story isn’t over yet. It’s still being written, as yours is too J In His grace and as a part of His incredible plan (that FAR exceeded my own), God gave me four of the most precious, adorable, squirrely, character deepening children, and He did it all in 5 years. J They weren’t in my perfect little plan. Isn’t that crazy to even say? But it’s true, and part of the “humbling” plan I’m on with the Lord is to always keep it real. He gets way more glory in my weakness than he does when I try to display my strength. So that’s what life is about now…It’s about His plan for me. It’s about His glory through me. It’s about remembering that He had a plan set for me before the foundations of the world were created, and that included being the wife to John and mom to Ryder, Cole, Cora and Rylee. Everyone of them perfect, and everyone of them amazing, and everyone of them perfectly teaching me about what it means to truly LIVE, making every moment one that I could fall on my face, thankful to my Savior for…whether I’m walking through a park with four happy faces or changing a diaper while it’s clear I’m needed in the other room as well, He has called me His own…and I’m absolutely enamored with my God the One who also continues to save me from myself. He’s re-creating me day by day, moment-by-moment and promises to never stop making me more and more, His. This is so true. :o) I am constantly trying to build myself up to a place that God has to bring me down from. :o) It really is pride, in a way. And trying to be worthy of praise instead of praising the one who is worthy. Thanks for sharing your lovely thoughts! I know that place all too well! Glad to know I'm not alone...excited to read from you too, Disney :) He is the only one worthy!! !